Year No. 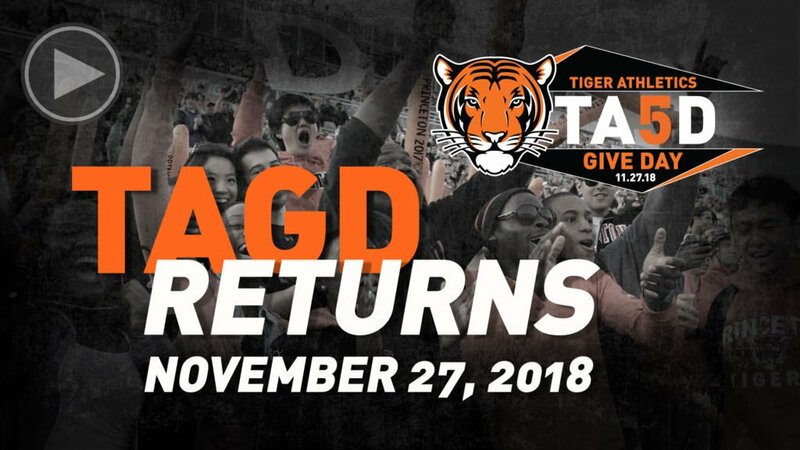 5 of Tiger Athletics Give Day (#TAGD) is just around the corner, taking place on Tuesday, November 27th. Make a gift online at www.TigerAthleticsGiveDay.com or call 609-986-TAGD (8243) on Tuesday, November 27th (between 12:00 a.m. EST – 11:59 p.m. EST). All gifts of $20 or more will count toward three main competitions among the Athletic Friends Groups and, most importantly, will help your team reach its goals. Be a part of the excitement leading up to TAGD by sharing special Princeton Athletic memories and photos or by just sharing words of encouragement to our student-athletes on social media. Remember to use #TAGD and #TigerUp. Follow the live leaderboards and our social media blitz on Tuesday, November 27th to track the competitions and be a part of the fun. We would like to once again thank the Princeton Varsity Club Board of Directors and Advisory Committee for contributing more than $200,000 in Bonus Funds that will be at stake across several unique competitions. Additional details on the specific competitions and associated bonus funds can be found on www.TigerAthleticsGiveDay.com. The Princeton Varsity Club will be competing to obtain 15 new Lifetime Members on TAGD, receiving $10,000 in Bonus Funds should it achieve this goal. Lifetime Membership entails a one-time, tax-deductible gift of $5,000 which provides essential long-term support for PVC programs and initiatives that benefit all 37 varsity teams and 1,000 Tiger student-athletes. Click here to learn more about Lifetime Membership and view the current roster of PVC Lifetime Members. We thank you very much if you have already donated to an Athletics Friends Group or the PVC in fiscal year 2019 (July 1, 2018 – June 30, 2019). You have helped Princeton Athletics get off to a strong fundraising start this fall. If you’d like to donate again on TAGD, you will play an important role in helping us reach our annual goal.